It’s mainly all sunshine and blue skies in Playa Del Carmen, but when it rains, it pours. That said, even during the rainy season of June – October, you will be able to enjoy the beautiful, paradise beaches, outdoor activities, site seeing, and much more. As a tourist, we realize it can be a little frustrating, that is why we’ve rounded up 5 fun activities to do when it rains in Playa del Carmen. Unlike many places around the world, rain doesn’t necessarily mean you have to be stuck inside all day.When the rain falls in Playa Del Carmen, nature beckons you to explore the Riviera Maya. 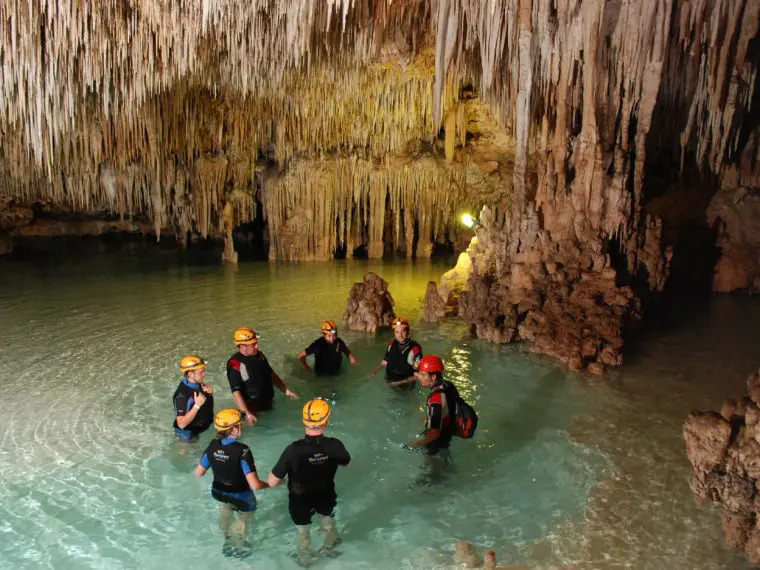 Rio Secreto is an underground river where you can swim and walk your way through the tunnels. You will be stunned by the impressive stalactites, stalagmites, and rock formations. As it is underground, you will be sheltered from the rain but you can still enjoy the fresh water of this magical underwater world. The Selvatica Gimmie All tour is perfect for those who don’t mind getting wet from the rain. From exciting zip lines, mud-splattering ATV courses aboard offroad Polaris, and a swim, splash, and jump into a stunning freshwater cenote, the Selvatica Gimme All tour will satisfy adventure-seekers of all levels. The jungles in the Riviera Maya are an understated part of paradise, they house some of the most fun, and beautiful natural wonders you’ve ever seen. Finally, finish up the adventure with a dive, jump, and swim in a beautiful open cenote. Afterwards, you’ll have time for a delicious lunch and some relaxation time under Selvatica’s large palapa. Get down and dirty on the Jungle buggy Adventure! Here you get to explore the dense Mayan Jungle as you drive your own buggy through the fascinating trails. This tour is unique because it gives you the opportunity to become more by giving something back. This is an experience that will leave a handprint on your heart forever. Playa del Carmen boasts a ton of inexpensive breakfast, brunch, lunch, and dinner spots. One of many tourists favorite fun activities to do when it rains is to venture off to a cute breakfast place. Some locations to consider are Sanborns (they have indoor and rooftop terrace seating) or Aldea Corazon Restaurant (nice atmosphere, good food and nice music). In case you wanted a few pointers on places to go here’s 10 delicious breakfast places in the area. At L’Aquarium you can witness over 200+ species of marine life. Here you will see such marine life as corals, sharks, jellyfish, starfish, rays and a multitude of fish. The aquarium covers three floors of the Plaza Corazon building! In each room there will be guides that can explain the exhibits. This activity will definitely keep you and your guests entertained on a rainy day in Playa Del Carmen.